A L.L.C. is a company with a flexible legal framework, with few mandatory rules and which places a special emphasis on the will of the parties as expressed in its articles of incorporation. The minimum share capital to form a L.L.C. is 3,000 euros (LSC, Art. 4). The share capital consists of contributions from different shareholders, which must be fully paid at the time of the incorporation of the company. Contributions in cash: this refers to the payment of any sum of money paid in exchange for shares. Contributions in kind: these are contributions that can take various forms (for example, providing an asset). An independent expert may intervene to conduct an evaluation of a contribution. Shareholders cannot claim an amount that differs by more than 20% of the value set by the expert. Failing to abide by this rule will result in the Commercial Registry refusing to register the company (Article 133.2 of Real Decree 1784/1996). The articles of incorporation of a company must be registered with the Commercial Registry, which gives legal tittle and status to a company (LSC, Art. 33). The information required for registration with the Commercial Registry (e.g. 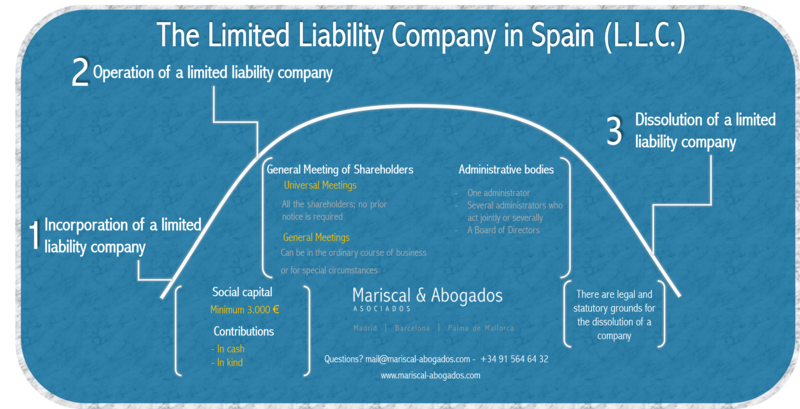 the identity of the shareholders, registered address, corporate purpose etc.) can be electronically submitted via a Single Electronic Document (SED). A General Meeting allows shareholders to decide by vote on areas affecting the functioning of a company such as: the appointment/removal of directors, the increase/reduction of capital, or deciding to liquidate company assets. The articles of incorporation may deviate from the majority rules provided by law. Universal Meetings (LSC, Art. 178): meeting of all the shareholders; no prior notice is required. The shareholders must agree (unanimously) that the meeting is to take place. General Meetings: they can be in the ordinary course of business (approval of annual accounts, appropriation of profit, etc.) or for special circumstances (the Board will meet whenever it is necessary for the corporate interest, LSC, Art. 165). If all the shareholders are present during a general meeting, it then becomes a universal meeting. The articles of incorporation may provide different types of administrative bodies that will adapt to the needs of a company.